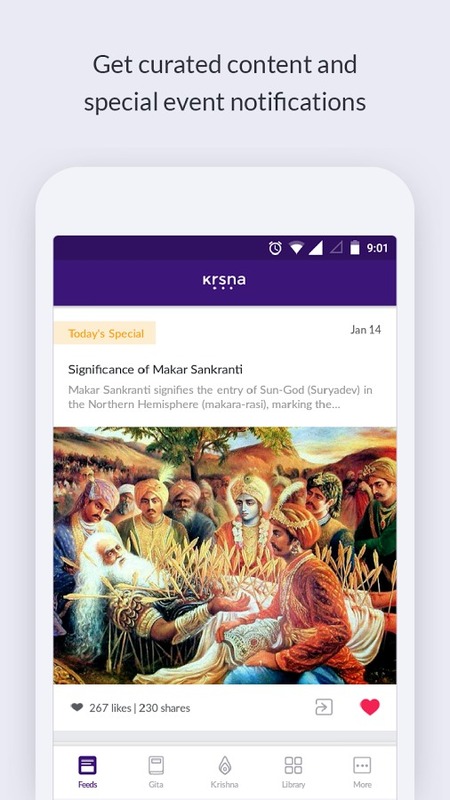 Krishna (Kṛṣṇa) Android App relased by ISKCON - An Intuitive app for all! Lord Krishna’s teachings through the Bhagavath Gita and Mahabharata have helped several devotees. He’s being worshiped since times immemorial. If one wants to learn more about Krishna, you have to read Mahabharata or the Bhagavath Gita. No one has ever tried to create a perfect channel for the technology world except some Gita Apps. Since it is a matter of utmost importance, ISKCON looked into this. ISKCON (International Society for Krishna Consiousness) has released an Android App in the name of Lord Krishna. Yes, they made it themselves for the good of all humanity. The Kṛṣṇa app is an all in one app for everything related to lord krishna. You can learn about the Gita chapters, stories, daily pics of Lord Krishna and feeds that give you important topics. The best part of the Gita option is that you can read it as a text or you can listen to it in English audio. This is remarkable as many people who don’t have time can listen to it in their daily commute. There are stories about Krishna where the lord himself has rescued many of his followers. Also stories related Lord Krishna’s childhood and his adventures. You can check the latest pictures of Krishna from various temples and divine kshetras every single day. Wonderful isn’t it? I’ve downloaded it and already and fell in love with it. It’s so fluid and fast and easy to explore that even your kid can open it. The app is helpful for those who want to learn the real Hinduism. The teachings of the divine one Lord Krishna can be learn from your mobile itself. You can get much more connected into Hinduism and learn how to lead a better life. Those who are into Hinduism, please download this app and start using it. The Bhagavath Gita is often misunderstood as if it must read only when someone passed way. Bhagavath Gita is for the living. It tells you how to live, how to love and how to make others live. So make yourself better and don’t forget to read ‘The Holy Gita’. Peace to all! Hare Krishna! How to plan your 20's and be successful at life!